Audio CD features over one hour of information on how to plan, produce, publish and promote your business podcast. LAS VEGAS, NV — MAY 29, 2007 – Demonstrating how to use the power and influence of podcasting beyond normally associated distribution methods, PodWorx today announced the release of their Four P’s of Podcasting CD, which features four key episodes from their Podcasting For Business podcast. With a total run time of over one hour, the Four P’s of Podcasting CD will give the listener a thorough understanding of what podcasting is and how it can help any organization reach out to customers, prospects, partners and employees. "For many people, the concept of podcasting is a new one," says Scott Whitney, president of PodWorx, LLC, "Instead of requiring somebody to already understand the mechanics of listening to a podcast before learning more about how to properly deploy one, we are broadening our reach by ensuring anybody can learn about podcasting, regardless of their understanding of the technology." The CD teaches the listener about the simple and repeatable process PodWorx uses to help their customers understand how podcasting works. It features detailed discussions about how to Plan, Produce, Publish and Promote your business podcast. 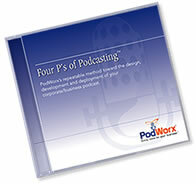 The Four P’s of Podcasting CD is available now and sells for $9.95. Discounts are available.